Surfing, with a few important exceptions, is a low-impact sport. Many surfers push the board out in their 50s, 60s and beyond. One place you’re guaranteed to take a beating is where a steep shore takes the full force of a plunging breaker wave. Each wave hitting the shore might appear to disappear, but physics dictate that the energy driving all that water is going somewhere. If you happen to be standing there, that force is going into you. Bowling ball will take out the pin – you get the picture. Surfer, Clark Little makes a living betting that he can outsmart the wave, dodge the physics. That gives him just enough time to take the pictures that have changed his life and sent his work around the world. In the age of Instagram, you’re never further than ten feet from someone carrying a camera in their phone. Hawaii is one of the most photographed places on the planet. So how is it that Little defied the waves and the odds and to make a living photographing the U.S’s Aloha State? A supervisor of the Wahiawa Botanical Gardens in Oahu, Hawaii, Clark Little comes home from a day of work. He finds his wife Sandy hanging a picture of waves on the family wall. He decides he can do better. He goes out and does it. Now, before you look to your own walls and decide that you could take a better picture than whatever your spouse has hung above the computer, there are a few more details to Little’s story. First up, he’s a lifelong surfer who knows the waves, the shore, the particular light of his subject. He’s spent decades imbibing the rhythms of the Pacific Ocean at Waimea Bay on Hawaii’s North Shore. It’s Little’s knowledge of the beach’s ever-shifting mood that make his photographs feel like windows into a world most of us never see. And as for the fact that he’s succeeding as a photographer in one of the most popular tourist destinations in the world? Well, his photos take a unique angle. As a surfer, Little looks inside the tube, just before the wave crashes. Threat and tranquility in the same moment. And a moment later, that scene is gone forever. 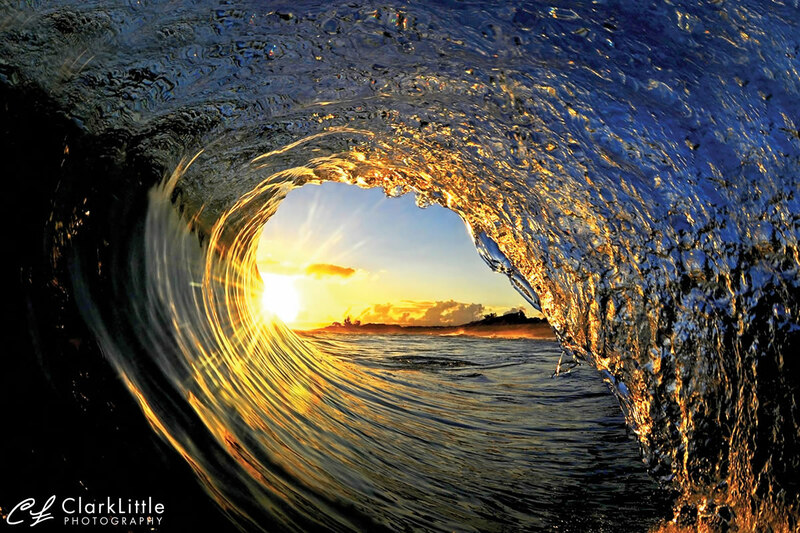 There are reams of film and shelves of books with images of waves and surf, but mostly shot from the outside. Clark’s brilliant move was to muster all he’d learnt over the decades and dive in, into the wave. Little left that day job at Wahiawa Botanical Gardens long ago. 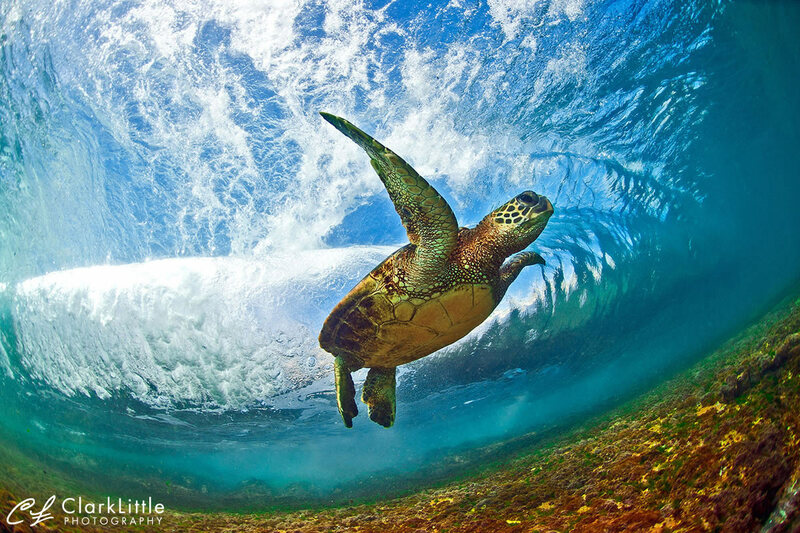 He does spend his days on the beaches of Hawaii’s North Shore. But it’s a little harder than it sounds. The fact is, those days can involve standing in the shorebreak of Waimea Bay for five hours, snapping thousands of shots to get the one that makes a day worthwhile. He’s dodging thousands of waves, knowing it would only take one misstep to have a very bad day at the office. 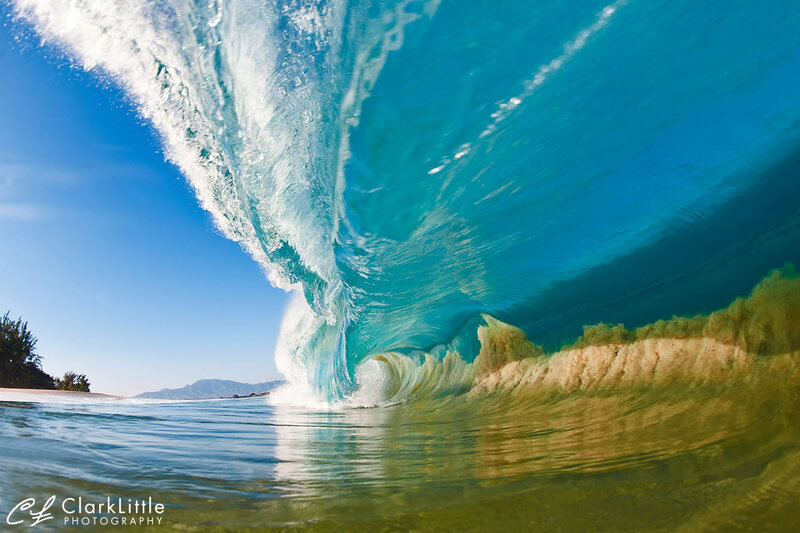 To join Clark Little at the beach and see what he sees, follow him on Instagram. 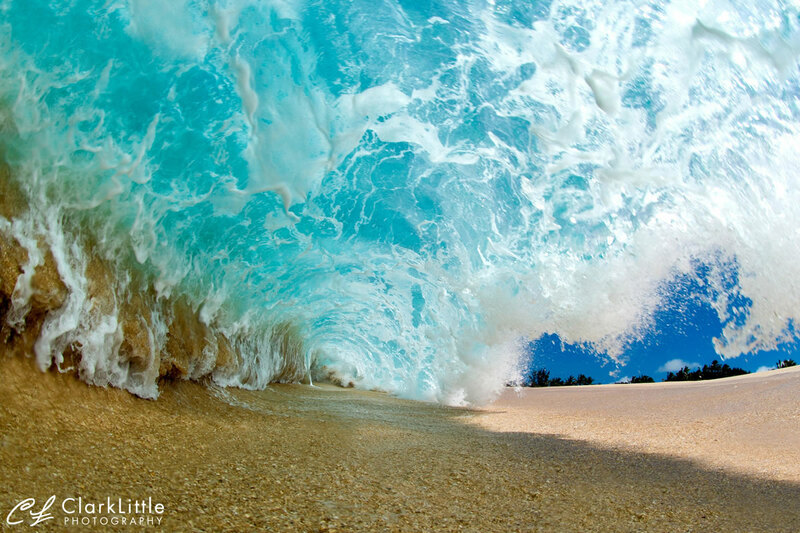 To take his pictures home with you, grab a copy of Little’s photography book, Shorebreak, from his website.